Katherin Canton earned a Bachelors of Fine Arts from California College of the Arts (CCA), with an emphasis in Community Arts through a studio practice in photography and textiles. During her time at CCA, she become the administrator and Community Collaborations Director at the volunteer-run arts center Rock Paper Scissors Collective (RPSC). With RPSC she developed the funding, business and partnership processes that resulted in the program being awarded over $80K during her tenure. For the last decade she has also worked in Arts Education and Youth Development through Youth Art Exchange (formerly Out of Site), as a youth advisory board member, class and darkroom assistant, and teaching artist. Most recently as the Administrative Gallery Coordinator with Pro Arts, she was the lead on business development/operations, volunteer and event management. Affiliations include, the KONO (Koreatown Northgate) Community Benefit District, the Oakland Makers, the co-founding the Oakland Creative Neighborhoods Coalition, and the Housing Rights Committee of San Francisco. Canton is currently the Co-Director with the Emerging Arts Professionals SF/BA and the Organizer for Arts for a Better Bay Area. 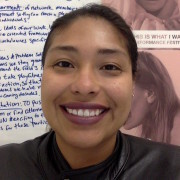 She strives to be a resource/connector for the Bay Area arts community and is seeking to further develop the intersection of creative/cultural expression and urban policy.